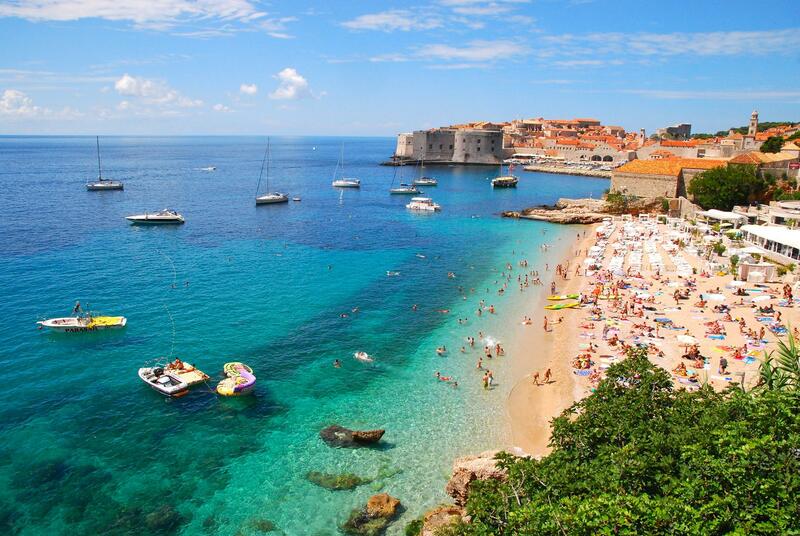 Dubrovnik is one of the most beautiful and singular cities in the Mediterranean Sea. It is nowadays one of the most prominent destinations in the area, and it has joined the UNESCO list of World Heritage Sites. Its main attraction is the so-called Old Town. Marble streets, baroque buildings and endless views of the Adriatic Sea make this old medieval fortress a unique place in the World. Surrounded by a series of defensive stone walls, you can really feel inside an episode of Game of Thrones. There is still a 21.35 km2 (8.24 sq mi) city outside the walls, although most of the tourists only visit the Old Town. Ancient City Walls is the #1 must do, and here I agree with Trip Advisor. 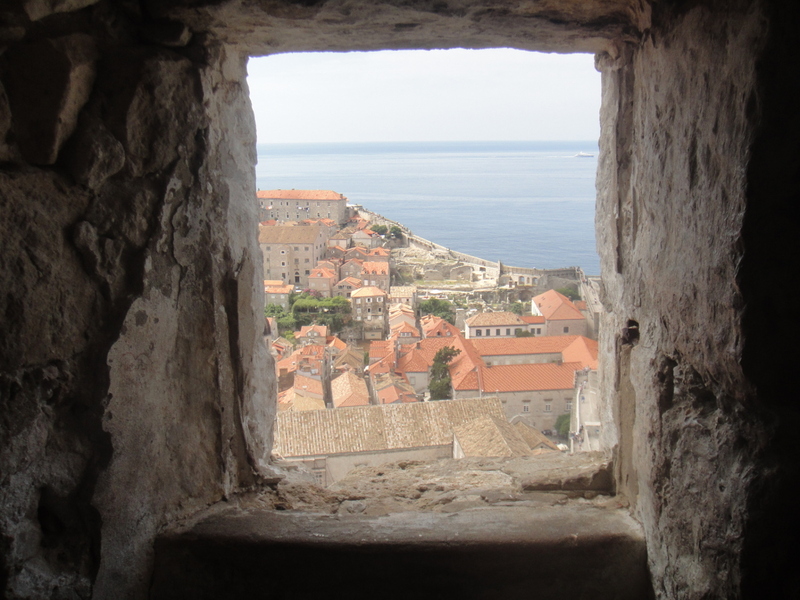 No trip to Dubrovnik would be complete without walking around its walls. You will find endless spots to take unforgettable pictures of its buildings and the Adriatic Sea. The walls were built in the 7th century, and can be up to 25 metres high and 1.5 metres thick. They are very well preserved, and they open to the public from daily from 9 am to 5 pm (May-mid October until 7 pm). There are entrances from near the Pile Gate, the Ploče Gate and the Maritime Museum. The price is 100/30 KN (~15 USD). The Old Town is inside these walls, so cars cannot get in. The parking spaces outside are scarce, so you may need to park far away from its entrance. There are a few private places but they also get full easily. 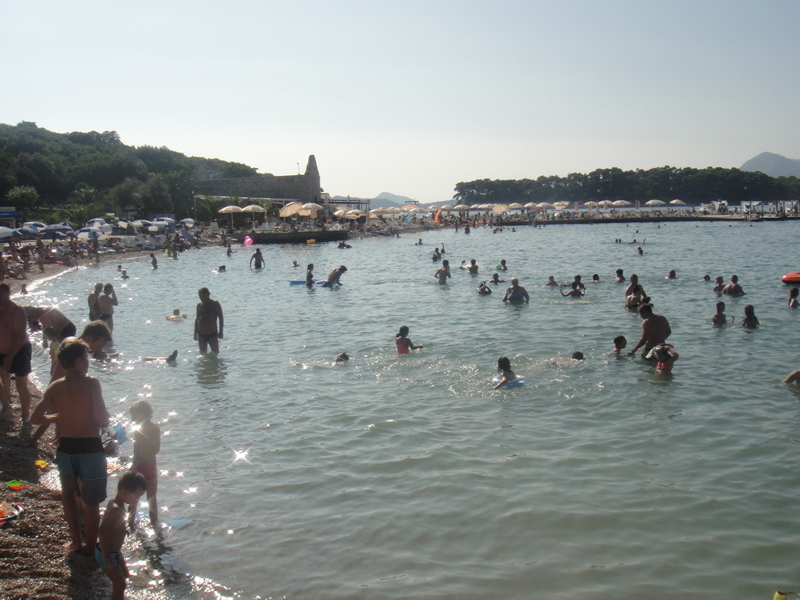 Banje beach is Dubrovnik’s main public beach. It is also the closest to the Old Town, which makes it the most popular for tourists. 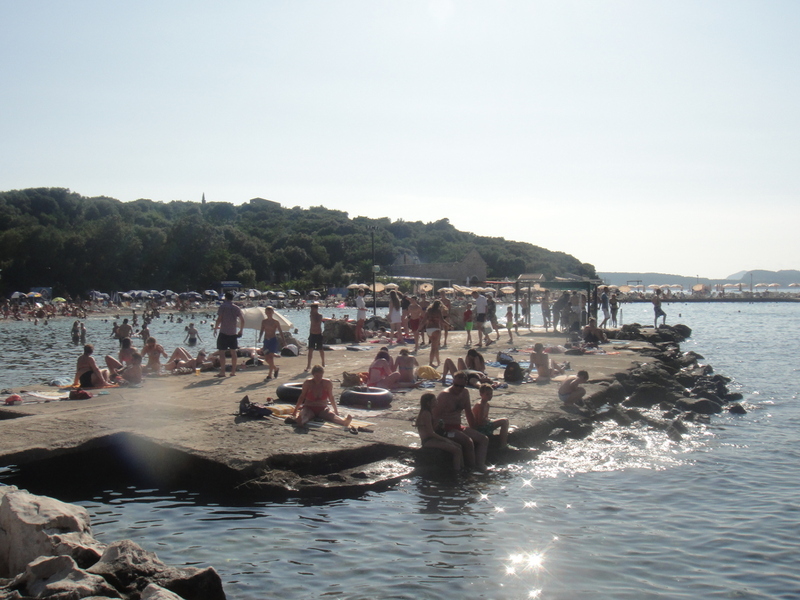 The sand area is quite small, so normally it gets crowded easily. There is a beach club called Eastwest Beach Club, where you can buy food/drinks and also rent umbrellas and sunbeds. The place is nice but quite pricey, and it also takes half of Banje’s sand area. But there is also a supermarket upstairs where you can buy cheap stuff, and also a very good bakery called Tisak. There are two entrances to the beach, both of them with stairs. One is the main entrance to Eastwest and the closest to the Old Town, and the other one is on the other side. There are only a few parking spaces near the beach, so you may need to park far away from its entrance. We were with a car because we visited Split and Zadar on the same trip. What we did (it was actually a recommendation from a local) was to use the parking of a hotel nearby, which is called Grand Villa Argentina. They charge per day, but it is still quite handy and not super expensive. Copacabana beach is probably the best beach in the city. It is only 10 minutes by car (or 60 walking) from the Old Town. They have a large (compared to the others) area with small pebbles and sand. You will find good facilities on both sides of the beach. There are two companies renting sunbeds, one of them has plastic ones which are cheaper (~USD 6) and the other one has better ones with mattresses for around USD 17. You can also bring you own towels and basket and find a good spot. There are a restaurant and a bar as well. The water is clean, clear and warm. If you walk to the end (opposite the restaurant) you can find a good view of the Franjo Tuđman suspension bridge. Normally is not super crowded as Banje, but it can get busy during weekends in high season. They also organise after beach events with music and cocktails. This was my favourite tour of the trip and I would totally recommend it. 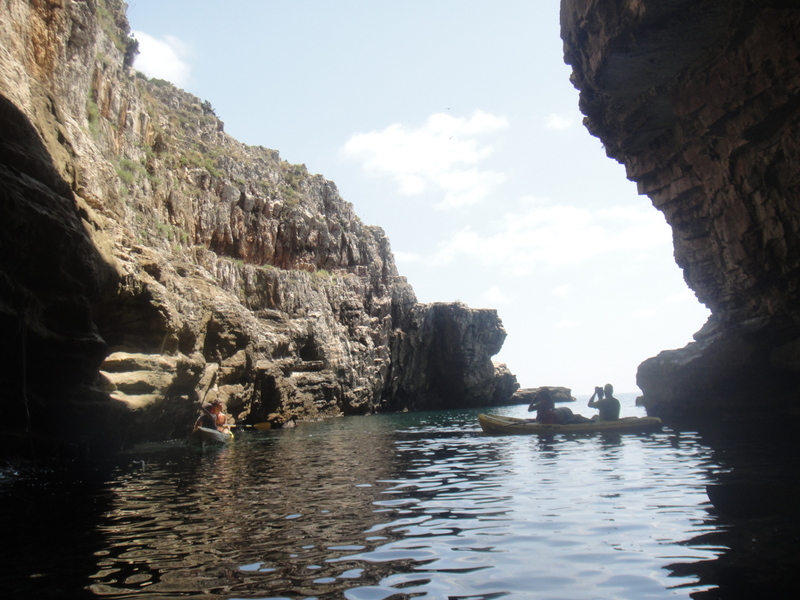 You will paddle along the city walls until you reach Betina, which is a small natural cave. There you will stop for a break, and you will able to snorkel and -if you are brave- jump from a cliff. You will also have a snack (we got a bottle of water, a sandwich and an apple) on a tiny beach. 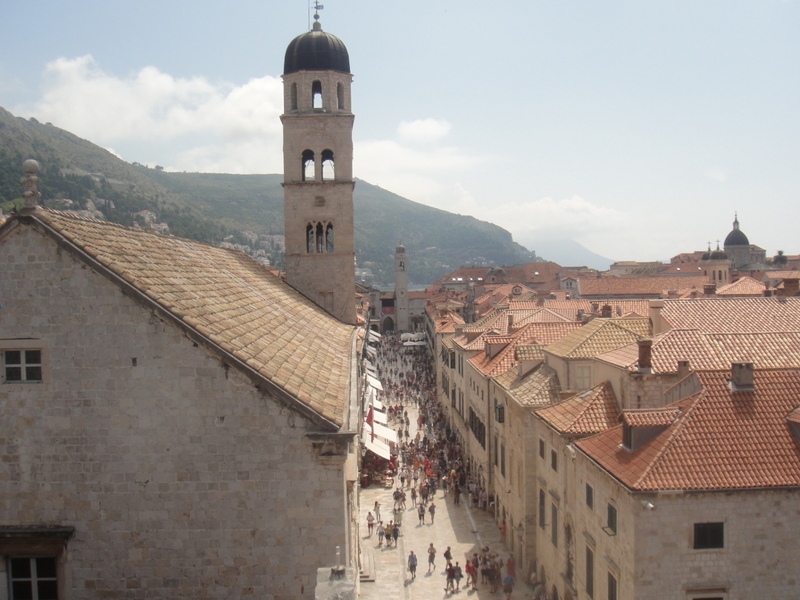 This half-day tour departs from Dubrovnik Old Town (taking the stairs down from Pile gate). The instructors will teach you how to paddle and handle the kayak, so no experience is necessary. They will also tell you about the city walls and show you amazing spots from the sea. I remember there was a break in the middle of the way, from that point those who were tired took a shorter path, and the rest (fit group) took a longer one. You will find a few places where you can hire the tour. 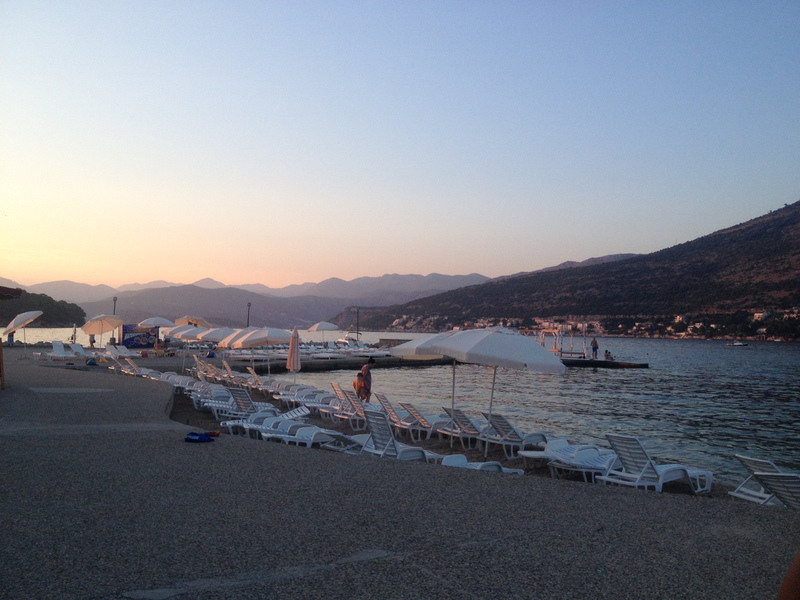 There are little kiosks both next to Pile and Ploče Gates. Normally there are three tours per day at 9:15am, 1:30pm and 4:30pm. You can find more info and also hire it online here (USD 39.60). 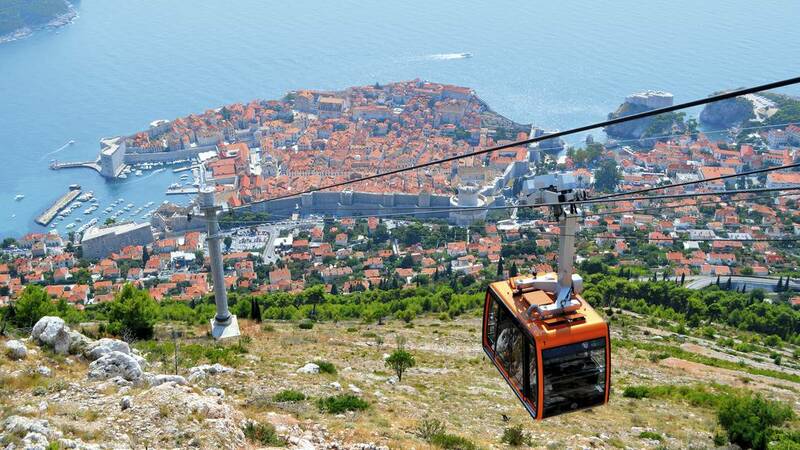 I also consider that the Cable Car is a must. You can take it just outside of the walls, only 15 minutes away from the Pile Gate (northern side of the town). A return/two-way/roundtrip ticket costs 120 KN (~USD 18) and each way takes around 3 minutes. The timetable changes by month, so check it in advance. There could be a long queue during high season so be prepared to wait. Once on top of Mount Srđ (413 metres high), you will enjoy a brilliant panoramic view of the city and surroundings, including Lokrum Island. There is also a snack bar and a restaurant called Panorama, which offers Mediterranean cuisine. You can check opening times, prices and even buy tickets online on the official website. Game of Thrones is one of the most successful fantasies TV series nowadays. It is filmed at different locations in Northern Ireland, Croatia, Iceland, Malta, Morocco, Spain, Scotland, and the United States. 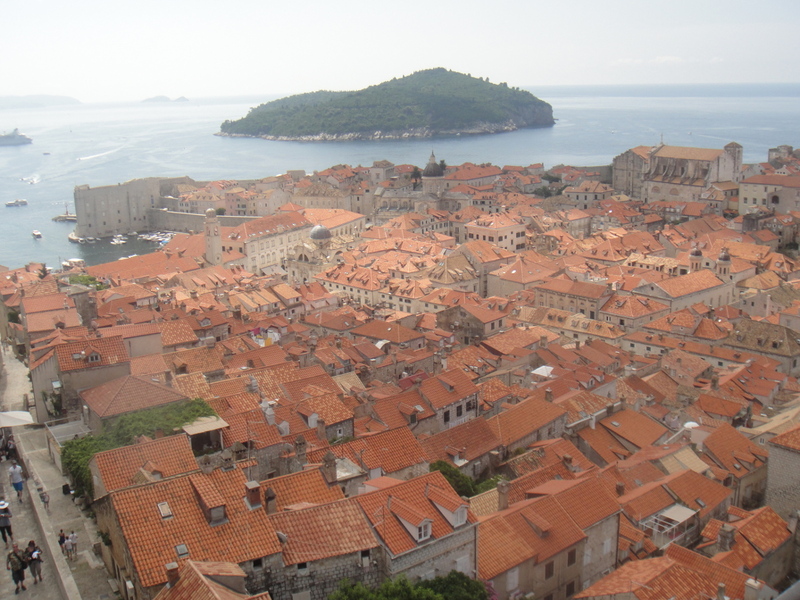 The show has attracted millions of viewers from all over the World and has become a huge win for HBO but also for Dubrovnik, given that their visitors keep increasing with every new season. 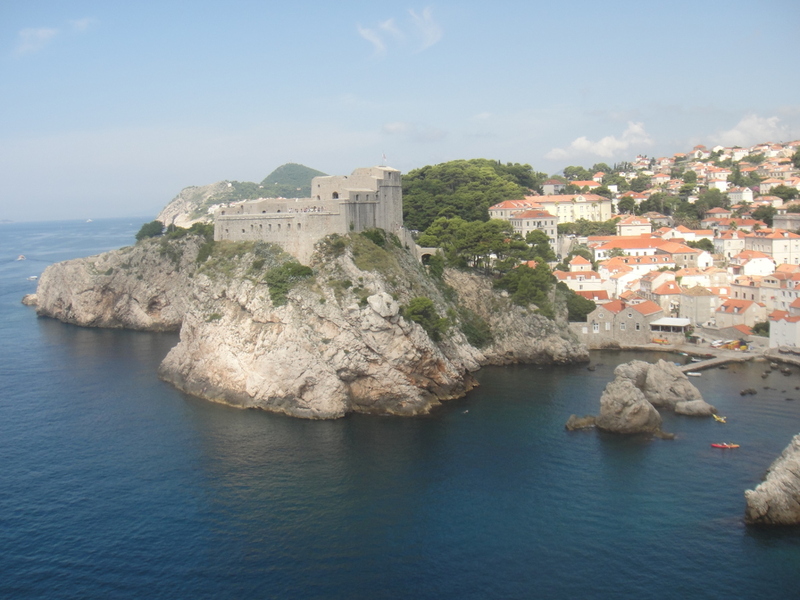 There a few filming locations in Dubrovnik that you can explore yourself or you can visit them as part of a walking tour. If you decide to do it on your own, I recommend the following two posts containing a compilation of places, including “real vs movie” pictures: brandsandfilms.com and radiotimes.com. One of the great surprises during my days in Croatia was their bakery. Some of their specialities are Štrukli (cottage cheese, sour cream and eggs), Pogača bread and Savijača. 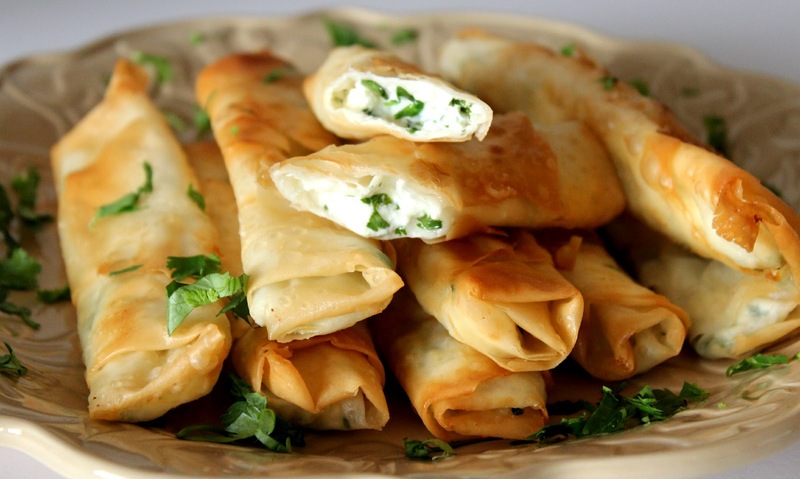 But my favourite is actually a Turkish one called Börek. “Is is a family of baked filled pastries made of a thin flaky dough known as phyllo, found in the cuisines of the former Ottoman Empire” [Wikipedia]. They have them filled with spinach, cheese or meat. The bakery I would recommend is called Tisak and it is located just outside the Old Town, 30 metres from Ploče Gate, which is the closest gate to the port/harbour. You can easily find it in Google Maps (street view link). Besides their bakery, being next to the sea makes the Old Town a great place to have seafood. Squids, octopus, shrimps, tuna, mussels and cuttlefish are easy to find all around. Croatia has also a strong influence from Italy, so you will also find a good variety of pasta. One highlight is the cuttlefish risotto (Croatian: Crni rižot, Italian: Risotto nero). Regarding restaurants, my favourite was Azur. Their cuisine’s own definition is “Mediterranean cuisine with a twist of Asia”. Great atmosphere, friendly staff and very tasty and creative food. It can be tagged as “little-hidden gem”. They do not have a large space and it gets busy in high season, so make sure to avoid peak times (actually better to go early because they can run out of some food) or make a reservation (a table outside if possible). Vietnamese noodle salad, chilli prawns with cashew nuts, crispy salmon, and laksa are some if their excellent dishes. They also have some vegan options on the menu. Another recommendation is Pantarul. This one is a bit far from the Old Town, but it deserves the #1 of TripAdvisor. Cool and modern, they offer innovative, fresh and inspiring food. One highlight is their fish tasting menu, to try a variety of seafood in one go. The staff is attentive and helpful. The place is getting popular so better to book a table in advance. Proto is also a good choice inside the walls. They have an extensive menu, with fresh fish and seafood pasta being their speciality. Spaghetti with prawns and sliced truffles, grilled sea bass with potatoes, fish stew with polenta and oysters are some of their main meals. Restaurant 360 is another quality restaurant offering a magnificent view of the Harbour from a series of terraces and open-air tables. They serve French fusion and sophisticated Mediterranean cuisine at exorbitant prices. We stayed at a hostel this time. I think it is the only hostel inside the Old Town. It is called Hostel Angelina Old Town. Modest rooms but very well located, just 50 metres off the main street Stradun. Some other friends stayed in some apartments called Studio Banovac. They were in the middle of the Old Town, with a small kitchen and even a terrace, so an excellent option as well. You have more options if you are looking for more quality. I would recommend The Pucic Palace and Apartments Stradun. If you are willing to stay outside the fortress (which I would not recommend) and spend a bit more, you can check Villa Dubrovnik and Grand Villa Argentina. Luza Square is a good spot to have a drink. There are a few pubs with tables outside. The square also serves as the venue for processions and events throughout the year, and as a meeting point for tourists during the day. If you like Irish pubs, Karaka is a decent one inside The Old Town. Another good spot is Cafe Buza, with a great view of the sea. But the cosiest and original place is D’Vino Wine Bar. This tiny wine bar is hidden away in a narrow alley (Palmaticeva 4a, in The Old Town). The offer a vast range of Croatian wines, and the staff is friendly and knowledgeable. They have a curious wine tasting “flights” (either three reds or three whites) for about 7 USD. Regarding clubbing, the main club is actually inside the walls and it is called Culture Club Revelin. Its entrance is next to the Pila Gate, after climbing some stairs. Drinks are a bit overpriced and the music is basically commercial house (“janky remixes of Radio One’s hit list” for some people). If you like underground/Berlin-style techno you will probably hate this place or at least its music. Its strongest point is the location and the fact of being inside the walls. 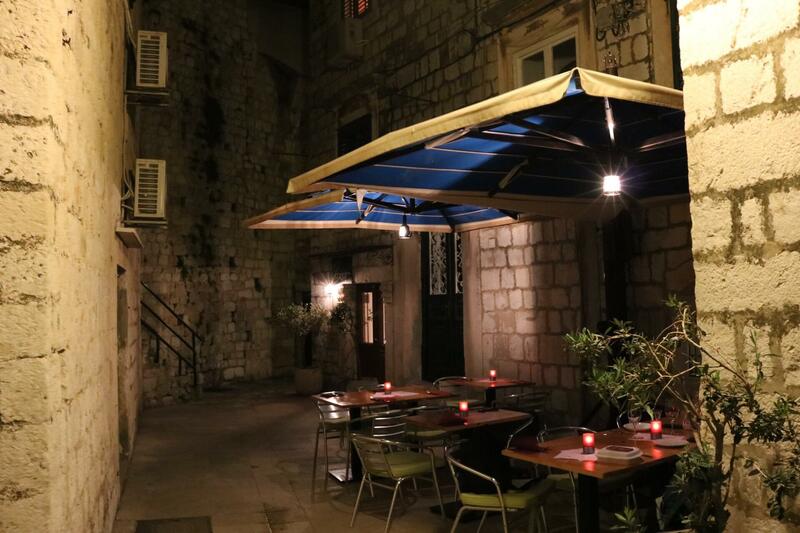 Anyway, there are limited late night spots in Dubrovnik, so this one may worth a visit. Smoking is also allowed inside.